Clomid is a treatment for infertility in women who are not properly ovulating. Clomid needs to be prescribed by a gynaecologist. 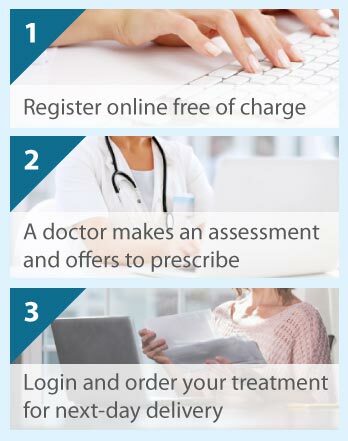 The Online Clinic can refer you to a gynaecologist in your area to get assessed for this treatment. To obtain the necessary referral letter, please complete a free online consultation. Clomid contains an active constituent called clomifene citrate, which is in the class of medicines known as ovulation stimulants. This medicine is used to treat infertility in women who are not ovulating correctly. Ovulation is the monthly release of eggs from the ovary. Clomid works by blocking the effects of the hormone oestrogen, which ultimately prevents the ovary from releasing eggs. By acting on oestrogen, the normal menstrual cycle is stopped and ovulation is stimulated. Your doctor will advise you on when to start Clomid. Clomid tablets should be swallowed whole with a glass of water. Initially, you take one tablet daily for five days. Then, if you do not have a period, your doctor will advise you as to whether you need a further course of treatment. Women do not usually require more than three treatment courses; only stop taking the medicine when your doctor advises or it may not work. If you take too much or forget to take Clomid, contact your doctor. Taking too much Clomid is likely to cause the ovaries to be over stimulated. You should not double the dose if you forget. Clomid should not be taken for longer than that recommended as this may increase the risk of ovarian cancer. Clomid is for use by adult women only. It is not for children, adolescents, men, or post-menopausal women (women who have been through the menopause). Pregnant women should not take Clomid, and it is advisable to have a pregnancy test before each course. Neither should Clomid be taken by women who are breast feeding (or planning to do so) because it can reduce a woman's milk production. If allergic to any of the medicines ingredients, do not take it. Additionally, if you have had problems with menstrual bleeding or your ovaries, cysts on your ovary (polycystic ovary syndrome), fibroids in the uterus (womb), a cancer stimulated by hormones, or liver disease you should not take Clomid. Care must also be taken if you have ever experienced fits or seizures, or you or a family member has hypertriglyceridemia (increased fat levels, named triglycerides, in the blood). Because some drugs interact with each other, thus altering the way they work, tell your doctor of all medicines that you are taking or have recently taken including those not requiring a doctor's prescription. Side effects that may occur include painful periods, bleeding problems during and between periods, thinning of the uterus lining, painful breasts, and skin flushes. Pain in the abdomen may indicate endometriosis, enlarged ovaries, or pancreatitis (inflammation of the pancreas). Nausea and vomiting, skin rash or irritation, tiredness, difficulty sleeping, depression or mood changes, headache, dizziness, and hypertriglyceridaemia may also occur. You should stop taking Clomid if you have numbness, weakness/paralysis on one side of the body, slurred speech, or become confused or unsteady, as this could indicate a stroke. Similarly, stop the medicine and contact your doctor if you get signs of over-stimulation of the ovary (e.g. pelvic, abdominal or lower leg pain or swelling, weight gain, breathing problems, or pass less urine). Clomid can cause visual disturbances, such as blurred vision, and spots or flashes in front of the eyes. Although these usually improve, see your doctor as the treatment may need to be stopped and you may need an eye examination. To note is that problems with your liver can cause the white of your eye to go yellow. Report to your doctor any sudden or severe headache, or mental health issues (psychosis).